A 26-year-old man in the University area of Tucson locked himself out of his house on Sunday morning. He tried to get back in by climbing down the chimney. He almost made it, too, except that the chimney is narrower at the bottom, and he became stuck just as his feet touched the floor. A neighbor eventually heard him yelling for help, and called the fire department. 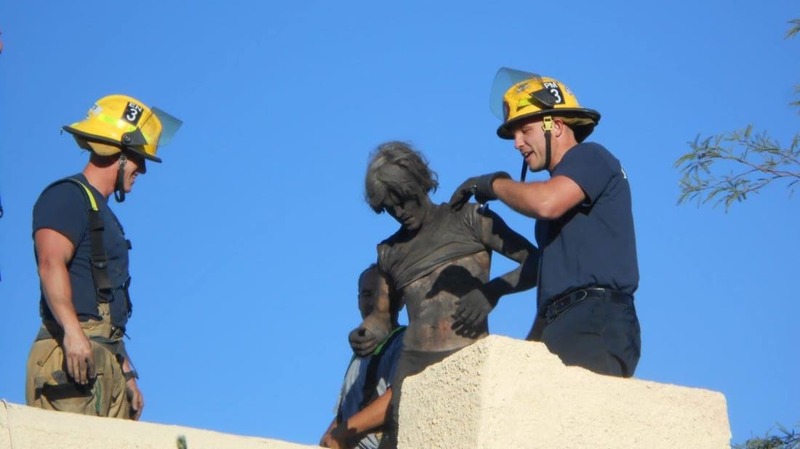 The Tucson Fire Department lowered a rope and pulled the unnamed man out. He had been stuck in the chimney for four hours. It all started in 1965, when Janice Parker bought a dress for her daughter Diana. She loved the dress and insisted on wearing it for her picture day in kindergarten. Her five younger sisters liked the dress, too, and they each wore it for picture day when they went to kindergarten. And so did their daughters. And then their granddaughters. It's held up remarkably well. Sure, there are some rips and tears, but nothing that can't be easily fixed. Of course, sometimes the girls would complain. The dress isn't the definition of current style and some of them said they were teased. But, they came around and the tradition continued. The latest girl in the family didn’t want to wear the dress, or any dress. But she did, along with pants and a baseball cap, so the tradition can continue. The bhut jolokia, or ghost pepper, registers at 1,000,000 on the Scoville scale, making it one of the hottest peppers on earth. Eating any significant amount of the pepper can be dangerous, as we see in a case reported in The Journal of Emergency Medicine. A 47-year-old man ate a hamburger with ghost pepper puree on it “as part of a contest,” became violently ill, and was taken to a hospital. He spent 23 days there after doctors found tears in the lining of his esophagus, with food debris embedded. He underwent emergency surgery to repair his esophagus. A bear entered a car in Grand Lake, Colorado, on Saturday, and apparently had trouble getting back out. The bear threw the transmission into neutral, and the car rolled into a tree on County Road 4651. Someone notified the Colorado Parks and Wildlife Department, who came and freed the bear from the car. The incident must not have seemed all that unusual in Colorado, as the story only appeared as an item in the local police blotter. A police officer in Brewer, Maine, was called to investigate a possible burglary at an abandoned house. Upon arriving at the address, he saw several people and prepared for a confrontation. Assistant City Manager James Smith was showing reporter Nok-Noi Ricker and photographer Ashley Conti around a city-owned, foreclosed ranch house at 91 Longmeadow Drive at about 2:30 p.m., which triggered a report to police. Sgt. Fred Luce drove up in a patrol car and confronted the journalists with his gun drawn, according to Ricker and Conti. Conti said Luce yelled, “Hey, what are you doing here! Come over here!” The police officer pointed his weapon first at her, and then Ricker, in the backyard for about 10 seconds, even though they identified themselves as journalists, they said. While the mix-up was resolved quickly, the police report of the incident differs from the accounts of the reporters, with Officer Luce saying he had his gun at “low ready,” while the reporters say he had the gun pointed directly at them. A Public Safety Officer said either response would have been appropriate for the situation. Students in Westchester County, New York, started texting their parents when their bus driver wandered around instead of driving to their school. The students were picked up in New Rochelle to be taken to the school in Harrison, but ended up in Yonkers two hours later. The students tried to tell the driver which turn to make, but he ignored them. The bus company, First Mile Square Transportation, fired the unnamed driver for not following protocol when he became lost.